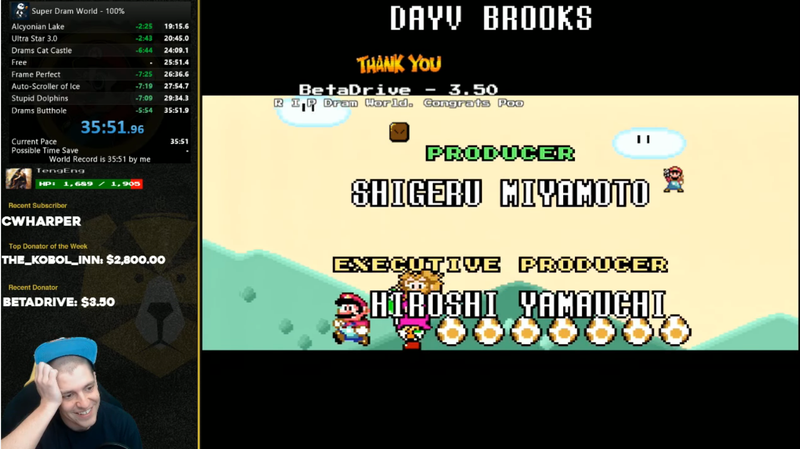 Super Dram World is an exceptionally cruel Super Mario World hack. It’s an accomplishment to survive a simple playthrough. Last night, one speedrunner raced through it and secured two world records in a single attempt. Grand POOBear is Mario speedrunner known for racing difficult Mario Maker levels and various hacks. Super Dram World is a “kaizo” hack. These hacks, which reorganize and reshuffle Mario games into death traps, grew popular after hacker T. Takemoto released Kaizo Mario World in 2007. Super Dram World, named after speedrunner dram55 is a minefield full of hidden blocks, tricky jumps jumps, and cruel enemy placement. Last night, Grand POOBear captured two world records in one run. He first secured the record for the Any% category, which seeks to beat the game as fast as possible. Although he died a few times on the way, he cleared the game in 24 minutes and nine seconds. After that, he pressed on the complete bonus stages, securing the 100% world record with a time of 35 minutes and 51 seconds.